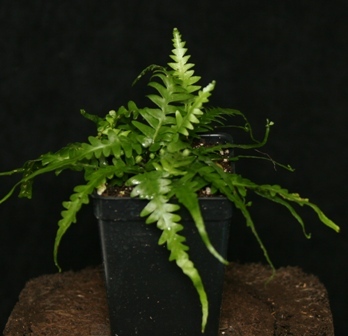 A naturally occurring hybrid between A rhizophyllum and A. platyneuron, this small fern has a wide range throughout much of the Eastern US. It is evergreen and equally at home in the terrarium or the shady garden where it is hardy to zone 4. The narrowly triangular fronds are deeply toothed and then elongated out into a narrow 'tail'. Reproduces vegetatively by producing new plants from the tips of the frond. Very unusual and easy to grow! Available plants are growing in 2" pots.